Mel Cook was born in Cleveland, Ohio and was raised in Akron. She attended Bowling Green State University where she received her BFA in Painting in 2009 and shortly after attended Illinois State University, where she received her Masters of Fine Arts in 2012. She currently lives and works as an Adjunct Professor at Illinois State University and at Illinois Central College, in East Peoria. Her work has been exhibited in Ohio, Illinois, and Massachusetts and will be featured in Studio Visit Magazine this Winter. At first glance Mel’s work is familiar and delicate, but at close inspection the rough brush strokes and inhibited mix of materials, take that familiarity into an “edginess” you don’t expect from a domestic set up. The range of the surfaces in her work can vary from quiet washes with pencil lines to thick oil paint strokes, magazine tears, fabric, coasters and knitted doilies. She often uses these materials to disguise our sense of space and change preconceptions of what “should be on a painting”. She brings a new powerful view to the old tradition of the Still life. 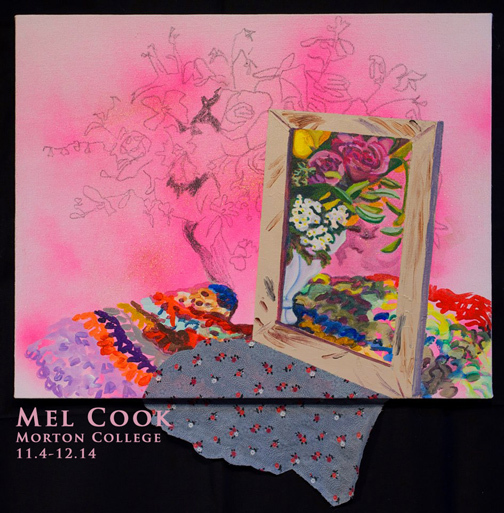 Mel’s work will be at Morton College from November 4th through December 14th. Building C. Second floor, across from the Student Union. 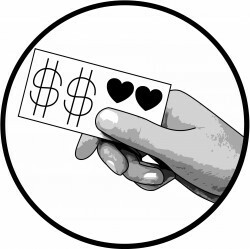 This entry was posted in Art at Morton College, Chicagoland and tagged art, artist, arts, Chicago suburbs, Cicero, Community, Community College, Contemporary Art, creating, creativity, curated, Diana Gabriel, mel cook, Mixed media, morton college, painting, Still Lifes.